WPW029434 WALES (1929). General view of Pontyclun, oblique aerial view. 5"x4" black and white glass plate negative. 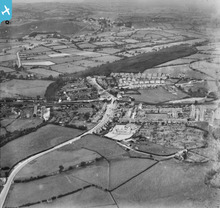 Title [WPW029434] General view of Pontyclun, oblique aerial view. 5"x4" black and white glass plate negative. Pontyclun from the south west.The main road goes to Cowbridge and Talbot Green.At centre is Pontyclun school opened in 1925 and behind it the old "Tin" school opened in 1911.River Row is far left and Maesyfelin farm bottom left. Pontyclun showing Llantrisant Station. Station closed and has now reopened as Pontyclun Station.Photo previously unidentified. Llantrisant Station now reopened as Pontyclun Station. Previously unlocated. This photo shows the area to the East of image WPW029433.In the centre of the image is Llantrisant Station now reopened as Pontyclun Station. The village of Llantrisant is in the background.